The topic of salsa has come up a couple times lately. First a friend asked me what store-bought salsa I recommended and I had nothing. (Saucy Dipper fail!) Then another friend asked what salsa I used in my chili. I don’t. I use regular ol’ tomato sauce. She couldn’t believe it. To remedy my salsa naivete I decided to do some research, which I started off doing with a blind taste test at my last book club. In all, there were six of us that tasted three different varieties. Our findings may shock you. 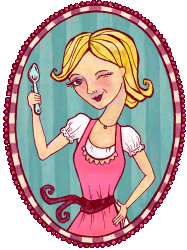 I chose ordinary brands–Tostitos, Pace, and Target’s Market Pantry. All three were medium spice and chunky. This way we were comparing apples to apples. No one knew which salsas were what brand (except for me of course). While this wasn’t a scientific test, I can say with confidence that each of the salsa brands taste basically the same–all six of us agreed. 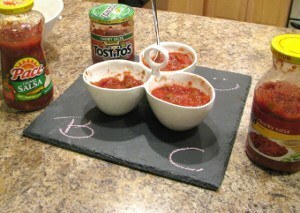 Tostitos salsa might be a touch saltier and a bit more watery. 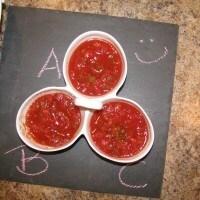 Target’s Market Pantry salsa was the crowd favorite, but only by a slim margin. This salsa seemed to have a more balanced flavor and the peppers had more kick. Given the similarity between these popular brands, I do not have a recommendation on what’s best. However, I can say that if you are like me and are not a salsa connoisseur, buy your salsa based on price. Stay tuned for more salsa research! Next time we’ll look at nationally-distributed artisanal brands. I like your product name. I’ll be on the lookout!